Samsung is known for their longer firmware support in Android arena, certainly more enough to be noticable it from other major manufacturers. That has been always the sweet spot of having a Samsung Android phone, no matter whats the price of it - $100 or $700, Samsung always considers its lineup for the latest release of Android operating system. Now i have such a good news for you people who know the names of Android 4.4 – KitKat. 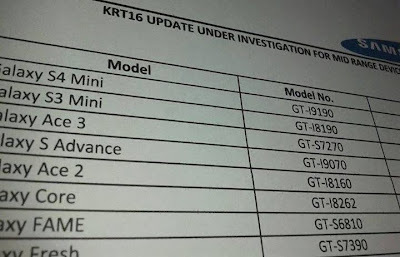 According to Sammobile, a very reliable source of Samsugn insider, it just came to light that Samsung is planning to update not only its high-end samrtphones like the Galaxy Note 3, Galaxy Note 2, Galaxy S4 and the Galaxy S3 for getting Android 4.4 KitKat in January but also as it turns out, the manufacturer is considering also bringing the latest version of Android to its more affordable droids. 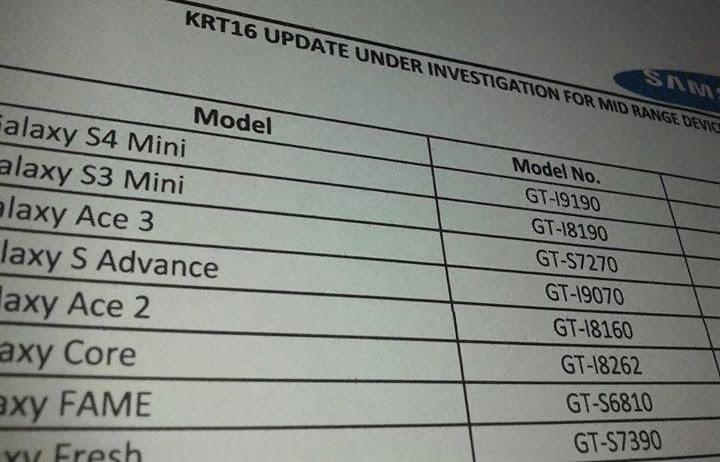 A leaked internal document shows that Samsung is investigating the Galaxy S4 mini, Galaxy S3 mini, Galaxy S Advance, Galaxy Core, Galaxy Fame, Galaxy Ace 2 and the Galaxy Fresh to see if they are capable of running KitKat smoothly. As you might know the latest version of the Android world lowers the minimum RAM requirement to just 512MB. Lets not forget that the custom TouchWiz skin that Samsung preinstalls on its smartphone. So what we learnt from it. Well, its not official news atleast. Samsung is just investigating the compatibility and hasn't officially announced any firm plans. So keep your eyes and ears open for more in the coming days.